I have been so blessed to be working with Green Mountain Roasters over the past 2 years to sample new K-cup Packs and share some of the highlights of their savings offers. 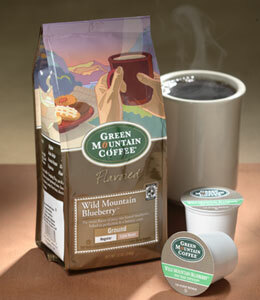 Sadly, that program is coming to an end, but I continue to fill my Keurig Brewer with fine, delicious Green Mountain varieties. When the people at Green Mountain asked me what my favorite variety was over the past 2 years, I had no trouble naming one: Wild Mountain Blueberry! It's mild, slightly fruity, and the perfect compliment to a morning breakfast or an afternoon snack. Now, it's my turn to pass on the love. I have the chance to give one lucky reader some of the Green Mountain Wild Mountain Blueberry to sample in their own home! Wanna Win? Just comment on this post with when you most love to drink coffee, and you're entered! You have until this Monday, June 24th at 11:59 pm CST to get your entries in. One per person, please, open to U.S. residents age 18+. We'll randomly pick one winner to get the prize. Full promotional rules here.